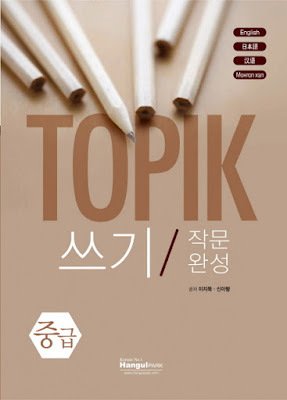 TOPIK Writing Completion-Intermediate (in Korean: TOPIK 쓰기 작문완성 중급) is a textbook to prepare for the writing section of the TOPIK. Writing is an inevitable part of the TOPIK test that determines 1/3 of the TOPIK test score and is the most difficult part for most foreign learners who are preparing for TOPIK. However, foreign learners often do not know how to prepare for the TOPIK writing. In addition, most of the teachers who run the TOPIK classes have difficulties in finding the writing materials to prepare for the class. Therefore, this writing composition book is targeted to the teachers who run the class and the learners who prepare the exam. The book has 8 units with detailed explanation written in 4 different languages including English, Chinese, Japanese, and Russian. Each unit is designed with 6 steps to help learners improving the TOPIK writing skills step by step. ▶ STEP 4: 기출 문제 살펴보기 - Examining an actual test question.